The street name — aka “odonym” (from ancient greek hodós “way, street” and onomastikòs, “denominating”) or “street toponym” — is a name identifying a public space in an urban area, usually an area of free pedestrian and vehicular movement giving access to buildings or private areas. The street names are usually part of an address and are generally composed of the “specific”, that is the own name of the place to be identified, plus a street type designation — aka the “generic” — that details the type of public space: e.g. “street” or “square”. In English the generics are usually suffixes, but in Latin languages such as Spanish the street designation is usually placed before the specific name, in other words it is a prefix. 2 – One of the distinctive azulejos of Madrid, the ceramic hand–painted street signs. 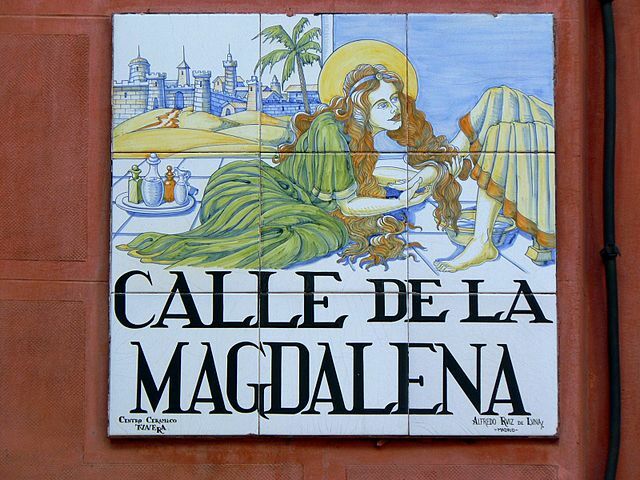 This one marks “Calle de la Magdalena”, that is a calle (street). The numerous, different types of public spaces can be thought of as belonging to two main categories: street and squares (or plazas). The former are developed along a main direction (length) and generally devoted to the transit of people or vehichles, while the latter feature a significant second dimension (width), are typical of urban areas, and are intended (at least in the European urbanistics) for social aggregation rather than simple transit. The generic denomination often refers to a specific street types, indeed namely to specific purpouse, characteristics or morphology of a road. Castillan Spanish too has an interesting variety of terms that may contribute important testimony about the urbanistic and linguistic history of a single city or an area. They are used in spanish–speaking countries and territories, so obviously the Spain with the exception of Catalonia and Basque Country which prefer respectively Catalan and Basque languages, but also hispanophone countries of Caribbean, South and Central America. As far as we can determine the origin and meaning of these terms, their use it is not dictated by strict rules but rather subject to the cultural, historical and urban influence of local communities. Avenida (Av. ): |aβeníða| avenue, this is typically a main urban road, usually wide and three–lined (Vox). Just like →Avenue, it comes from French avenue, past participle of avenir, “to arrive”. The term Avenida can be found also in portoguese. Barriada: |bariáða| group of buildings,(Vox) neighbourhood; this is a local road serving a homogeneous group of buildings or a suburb. Found especially in Andalusia (e.g. “Barriada La Carabina” in Chiclana de la Frontera, Cádiz; “— Ciudad del Alijarafe” in Mairena del Aljarafe and “— de la Paz” in Marinaleda, Sevilla). It is similar to →Barrio, →Urbanización, in Madrid also →Colonia. Barrio: |bário| neighbourhood but also locality, small town(Vox); found especially in Cantabria (Potes, Santander) for local roads serving a barrio. 4 – “Bulevar del Ferrocarril”, between El Carmen and Calle Madrid, is the wider street in Burgos (Castilla y León, Spain). 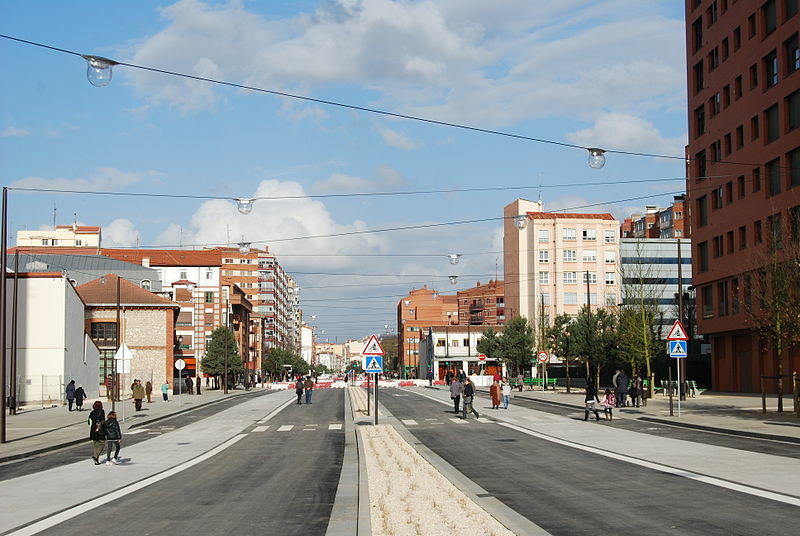 Bulevar: |buleβár| boulevard, usually a major avenue that is wider than →avenida (avenue), possibly multi–lane or divided with a median down the centre. It comes from French boulevard (found also in →english), in turn from Middle–Dutch bolwerc i.e. “fortification”, “defensive wall”. Since 15th century in France the term boulevard is used for promenades laid out atop demolished city walls (that would be much wider than urban streets) and from 19th century it has spread in other languages with the meaning of “broad avenue”. Boulevard: writing variation of Bulevar found in Spanish–speaking countries of Central and South America. Calle: |káʎe| street; this is the most frequent generic designation in Spanish and usually refers to a public space between building and devoted to transit (Vox). It comes for Latin callis, “path” (as though as Italian →calle) and indicates a wide range of urban road. Just like English →street, the calle in not only a mere transit space but also serve a social function, allowing neighbors to meet and interact on their walks and fostering economic activity such as window shopping and sidewalk cafes. As demonstration of that, the term calle is sometimes used also with the meaning of folks, people, community (Vox); from calle derives indeed the adjective callejero that means “living on the street”, both with meanings of wanderer (es. perro callejero, “street dog”) and of a social, friendly person, someone who likes to be “on the street”, in other words “among the people” (Vox). In Central and South America it is common that the designation calle is omitted or implied on street signs, so many roads do not seem to have the prefix but only the official name. 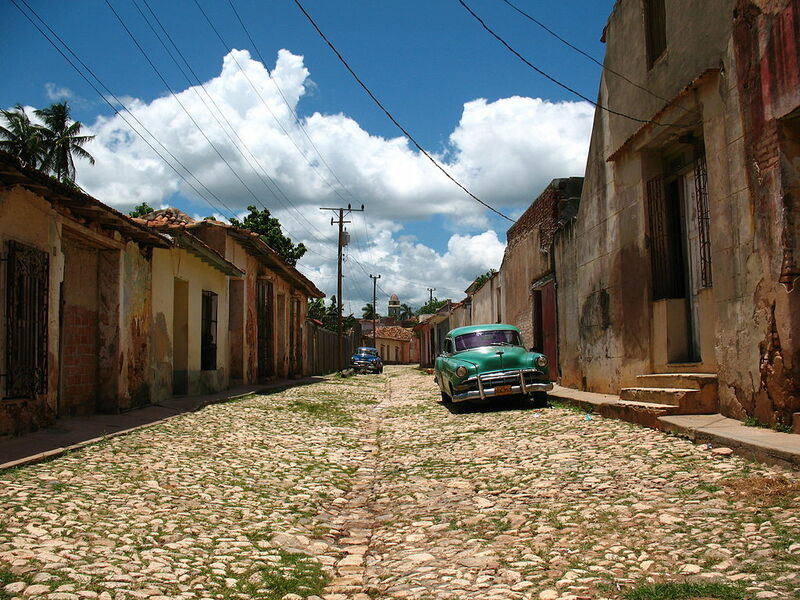 5 – A calle (street) in Trinidad, Cuba (foto José Porras, 2007). Callejón: |kaʎexón| alley, defined as a «long and narrow passage between two walls, buildings or terrain elevations» (Vox). A blind alley is called callejón sin salida, that is also a figurative for “no progress”. Calzada: |kalθáða| literally (road) pavement (Vox). As street prefix one cand find this only in Ciudad de Mexico for urban arteries with separate carriageways (e.g. “Calzada de Guadalupe”, see picture) and in La Habana (Cuba) for main, large roads running through the city (e.g. “— de Diez de Octubre”, the largest one). Around the historic “Calzada del Cerro”, laid down in 1803, was build the barrio (neighborhood) with the same name, the “Cerro”. Camino: |kamíno| path, trail (Vox) road; this applies to a wide range of roads, from trails to wide avenues. In Madrid is a wide street, broadest than a →calle: “Carrera San Jerónimo” and “Carrera San Francisco” are two main streets of the historic centre. The first was once called “Camino del Sol” and was built in the early 16th century; it runs form the square called “Puerta del Sol” (→puerta) to the ancient monastery of San Jerónimo el Real with its church, from which the name. The latter is the main axis of the Barrio de La Latina and it leads to the Real Basílica de San Francisco el Grande, from which the name. In Colombian cities like Bogotà and Cartagena, the term carrera (shorten “Kr.”) refers to a road that runs North-South, while →Calle and →Avenida are roads that run East-Wests in a grid–based naming system similar to Avenues (→) and Streets (→) in New York. The “Carrera Séptima”, once called “Calle Real”, was laid down in 16th century and nowaday it is considered the main axis of Bogotà. Carretera (ctra. ): |karetéra| road, this is usually a public road devoted to vehicular transit (Vox), broadly speaking this could be either a road or an highway. In Cuba, the “Carretera Central de Cuba” is the main arterial road of the island, that is 1139 km long. In Spain this is an highway (see →Carreteras radiales). Carretera de acceso (ctra. de acceso): access road, a public street that leads to a neighborhood (i.e. “Ctra. de Acceso al Barrio de Isabel la Catolica”, Ávila) or to a certain place (es. “Ctra. de Acceso al Aeropuerto”, Burgos) from whichit is named after. by José Escrigne (1851) lists the term carrils (plural carriles) whit the meaning of «traces left on the ground by the wheels of a wagon» or also of a path «for which can pass only one wagon». It comes likely from Carrilis, abbreviation of Caminus Carrilis. Circunvalación: |θirkunbalaθión| ring road, boulevard (from Latin circonvallatio -onis) i.e a street encircling a town centre. Usually it refers to an arterial road (e.g. “— De Alicante”), but in Almería (Spain) “Circunvalación Plaza de Toros” is a bended street that runs along the southern side of the Plaza de Toros (the “bullring”). Colonia: |kolónia| urban complex, neighborhood. Historically, in Madrid the colonias are planned districts built between the end of 19th century and early 20th century. Remarkable is the “Colonia Madrid Moderno” aka “La Guindalera”, built between 1890 and 1901 in modernista style i.e. the Spanish Art Noveau. Nowaday the terms still refers to wide range of complexes, also recent built, from group of buildings to series of suburban villas. In street namings, a colonia is usually a street serving one of these complexes (e.g. “Colonia Erillas“, “— Militar de Vilcàvaro” in Madrid), similarly to →Barriada or →Urbanización. Corredera: |koreðéra| according to the dictionary of “Real Academia Española” the term corredera meant a «site or place intended for the transit of horses» (sure enough it means also stables) from which the meaning of «road that was previously for horses». Found Andalusia: i.e. “Corredera Capuchinos” in Andújar (Jaén province) and “— San Fernando” in Úbeda (Cordoba) are avenues. This is more common as specific name, i.e. Calle or Plaza de la Corredera. Corredera Alta e Corredera Baja: in Madrid, “Corredera Alta —” and “Corredera Baja de San Paolo”, are two main streets passing through the Malasaña neighborhood. However, corredera could have a different etymology: it is argued that it derives from «ir de corredera», that means «to go on pilgrimage». The two roads are in fact on the path that once led to the small shrine dedicated to San Pablo, once located at Calle Fuencarral. The adjectives Baja (low) and Alta (high) refers to elevation profile. Costanilla: this is a short and narrow calle (street), with a steep slope in comparison to the surrounding ones. Cuesta: |kuésta| uphill, downhill slope, slanted ground (Vox); this is a calle with a steep slope, facing an uphill. Diagonal: |diaɣonál| diagonal, i.e. a road that cuts diagonally a grid plan (e.g. “Diagonal San Antonio“, Mexico City), just like →stravenues. Eje: |éxe| axis, route; in Mexico City this is one of the main →avenida of the urban grid, the most central of which is called “Eje Central Lázaro Cárdenas”. In Pozuelo (Madrid) “Eje del Pinar de Las Rozas” was the previous name of the current M-503 aka “Vía Augusta” (→vía). Glorieta: |gloriéta| sthis is a small plaza or roundabout with trees or flowerbed. It comes form 12th century French gloriette meaning a small decorated room intended for rest and reading of poetry, from Renaissance the term indicated a pavilion or a temple in a garden with the same function, and then a garden covered by vines. In Spanish glorieta in fact means also an arbour or a gazebo. Malecón: |malekón| cliff, breakwater, esplanade; this is usually a waterfront esplanade, found in Perù (Lima) and Ecuador (Guayaquil). Muelle: |muéʎe| quay, pier, the road running on it (es. “Muelle Príncipe Felipe” a Cartagena, Spagna). alley, a narrow lane through backwards of buildings (i.e. “Pasaje Pradillo” a Madrid). in Spain may also indicate a pasaje comerciàl, i.e. a peatonal street that can either be covered or not (Vox), lined by cafés and shops; inspired by Parisian passage of 19th that were an early form of shopping mall in Europe. 8 – “Pasaje de Doré”, Madrid. Paseo: |paséo| stroll (Vox), usually i.e. a wide avenue with large areas for walking. In Madrid there are three paseo (“de Recoletos”, “del Prado”, “de la Castellana”) that form the main North–South axis of the city. The first paseo was the large tree–lined avenue realized in 18th century with the urban reformation known as “Salón del Prado”. In Mexico City “Paseo della Reforma” is one of the most important boulevards, built in 19th century and modeled after Parisian Champs-Élysées. Found also in Granada e Salamanca. Plaza: |pláθa| plaza, square (Vox). This is usually an open public space commonly found in the heart of a town, used for community gatherings. The plaza identifies the center of community life so that in Spanish the term can be used as a synonym for inhabited place, village, city (Vox). Today plazas can also be used for transit and parking of vehicles, as pedestrian areas, often as home to public events such as parties, markets, exhibitions, concerts. 9 – “Plaza Mayor”, Madrid. Poblado: |poβláðo| village, i.e. usually a small village or hamlet in the surrounding of the principal town of a município (municipality). As street type, it refers to a road that serves a poblado and eventually the inners roads (larger villages have their own street naming). An example of poblado: “Poblado la Bazagona”, Cáceres, Extremadura, Spain. Puerta: |puérta| porta, i.e. a plaza where there was a city gate. E.g. “Puerta del Sol”, the mayor plaza of Madrid (where, among other things, is the “km 0” of Spanish roads), named after the city gate dating back to the 12th century, beyond which were the rural villages. The square was built in the 15th century, when the government buildings of the new capital of Spain were built, and in the following centuries it became the center of town life. Also in Saragoza, “Puerta de Zamora” is a circular plaza named after a pre–existing city gate. 10 – “Puerta del Sol” in Madrid (foto M. M. Vicente). Rambla: this term, that is common to the Catalan and Castilian languages, literally means riverbed and in Spanish toponimy indicates a road (usually a broad avenue) built on the bed of a dry or underground water course (Vox); it comes in fact from Arab raml that means sand, sandy shore. Although as a street designation this term typically belongs to the Catalan language (Barcelona, ​​Tarragona), it can be found in at least one city with Castilian toponymy: Santa Cruz de Tenerife, in the Canary islands. 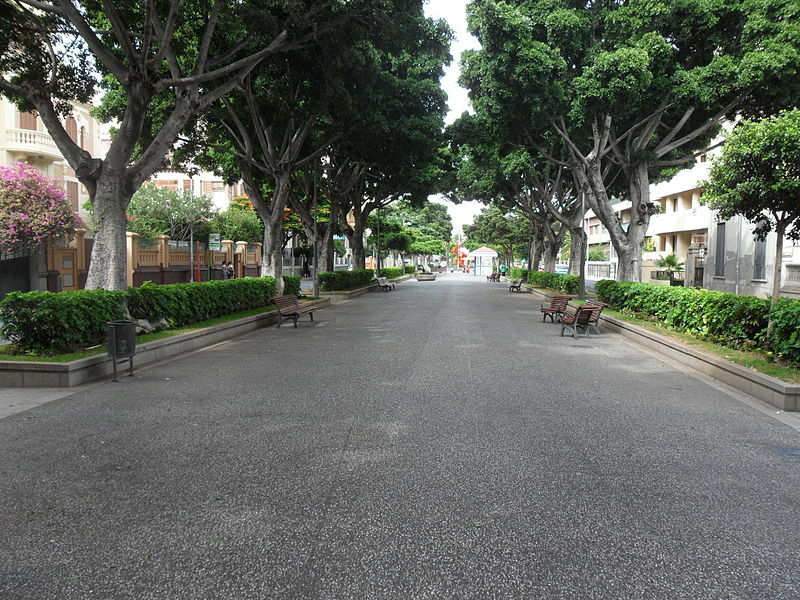 11 – The “Rambla de Santa Cruz” in Santa Cruz de Tenerife (Canary Islands, Spain). “Rambla de Santa Cruz”, the main artery of the city, assumed the designation rambla only at the end of the nineteenth century when it was titled “11 febrero”, the day of proclamation of the first Spanish republic while the current name dates back to 2008. Despite the original etymology of the term rambla, this road wasn’t originally a watertrail but a trail, “Camino de Los Coches” (trail of wagons) built in 1661. 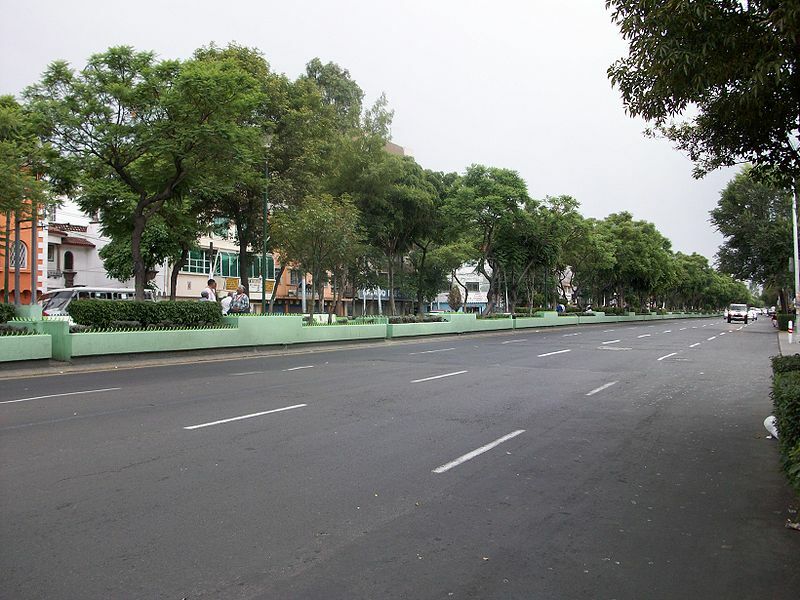 Another important Rambla of Santa Cruz de Tenerife is the one called “de Pulido“, a tree-lined avenue with shops whith a large grassy strip that is the tramway route. Retorno: |retórno| return, way back; in Mexico this is a road that, in fact, “returns” allowing you to go back to starting point: it can be a branch that joins the main street, such as “Retorno del Rey” on the Cancun (see map below) and various residential streets of Cancún and Hermosillo; or also a road ending with a roundabout, a loop for U–turn or simply a circular widening just like North American →courts. Ronda: |rónda| ring road, boulevard, i.e. a road «that surrounds a city or part of it» (Vox): it is usually synonymous to →bulevar, e.g. in Sevilla (“Ronda de Capuchinos”,” — de Triana”). “Ronda del Corpus” in Salamanca, so called for the portal of a franciscan monastry, looks like a normal calle. It comes from camino de ronda or paseo de ronda, that was the path surrounding the walls (or lying atop of them) intended for the ronda (from the French ronde), that is, the patrol ride of soldiers. The term ronda exists also in Catalan language topnymy with the same meaning: in Barcellona are called ronda the boulevards surrounding the “Ciudad Vella” (Old Town). Rúa: street, two main streets of the historic centre of Salamanca (Spain) are so called: “Rúa Antigua” and “— Mayor”. It comes from French rue, from which also the Portuguese rúa (both equivalent to Spanish →calle) and the Italian rua and ruga (→). Senda: |sénda| lane, path; used for small, local street or roads (e.g. in Spain “Senda de Granada” in Murcia; “— de las Ànimas” in Catarroja, Valencia), also pedestrian–only (lanes in Getafe). Found also in Mexico (Monterrey) and South America (e.g. “— Santa Marta” in Santiago, Chile). Transversal: |transβersál| cross road; in Bogotá (Colombia) this is a minor street perpendicular to an →avenida. Travesía: cross road; a minor street transverse to another street or road. Urbanización: |urβaniθaθión| urbanisation; a local road built according to a parcelling plan (i.e. a distric or a suburb). Comparable to →Barriada or →Colonia. Vía: |bía| way, from Latin via from which also the Italian →via (street). It comes from the Roman road “Via Augusta”, built by Romans between 8 — 2 b.C., that stretches about 15000 km crossing all of Hispania Province from Pyrenees to Cádiz. The “Via Augusta” still exists nowaday and coincides with the highway N-340, connecting Barcelona with Cádiz. Anyway, although rare, this term can be found in some relevant roads e.g. “Vía Complutense”, that is the main street of Alcalá de Henares (Madrid), or “— de las Dos Castillas”, a very long street (∼ 3km) that flanks the highway M-503 in Pozuelo (Madrid). Viaducto: |biaðúkto|viaduct, in Spanish this term refers to a wide arterial road, connecting two or more districts of a city and deployn large traffic flows. As street designation, it can be found in Mexic City where “Viaducto Río Becerra”, “— Miguel Alemán” and “— Río de la Piedad” are the three sections of the axis that crosses the center from East to West. 12 – A-7 “Autopísta del Mediterraneo” near Benalmádena, Málaga. Autopista: |autopísta| motorway, expressway; high standard controlled–access highway, with lane–diveder and no at–grade crosses, intended for high speed vehicular traffic; it can be both toll or toll–free. Autovía: freeway, controlled–access highway, similar to an autopista but with lower features and usually toll–free. 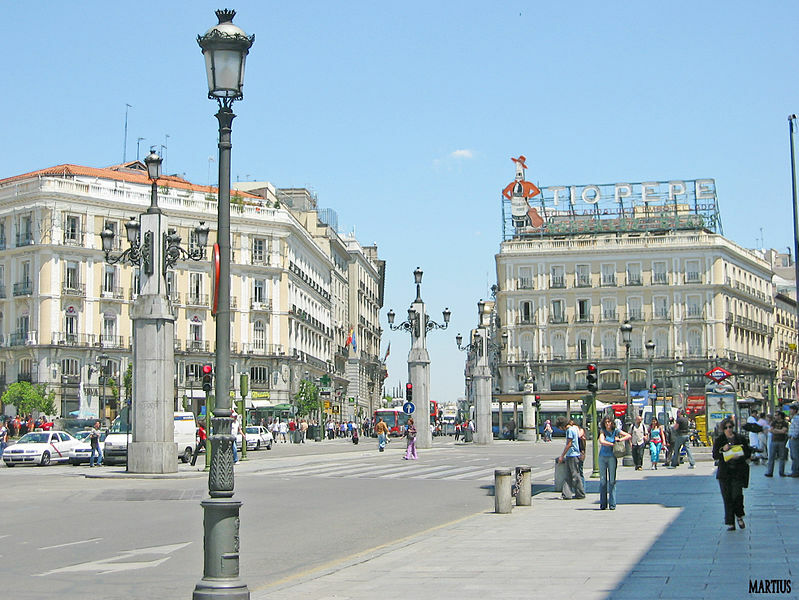 Carretera: state road, highway; in Spain the carreteras radiales are a network of national roads that radiate from Madrid and traditionally has the “kilometre zero” in the square called “Puerta del Sol” (see below). Expreso: in Puerto Rico, U.S. Spanish–speaking island, this is an autovía (freeway).
. 2000. Ristampa. Bologna: Zanichelli, 2003.
. 3. ed. Milano: Hoepli, 2009.